This pattern (and many of my others) is a participating pattern in the 2015 Indie Design Gift-A-Long. Receive 25% off participating patterns using code giftalong2015. The sale period will run Thursday November 19th 8pm (US-EST) through Friday November 27 at 11:59 pm (US-EST). The GAL2015 will run Thursday, November 19th at 8 pm (US-EST) through Thursday, December 31st at midnight (US-EST). 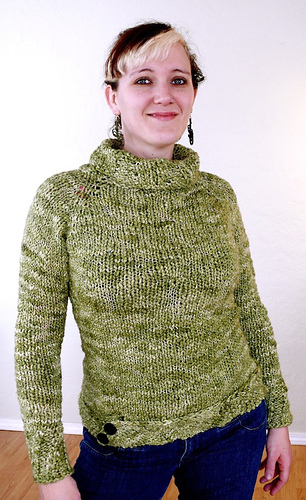 See the 2015 Indie Design Gift-A-Long Ravelry group for more information, to participate in KALs, and to win prizes! 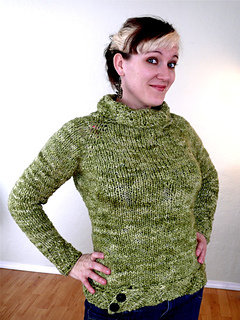 Libretto is the text used in musical work, and to me, the curves and subtle lines of this sweater really do sing. Tosca is a yarn that is full of texture without a complicated stitch pattern, so the slanted ribbing on the cowl/turtle neck, cuffs and an even more dramatic diagonal rib on the hem with a button closer add just enough extra to make a simple sweater more interesting. This sweater is designed for the advanced beginner. It is worked seamlessly from the top down. 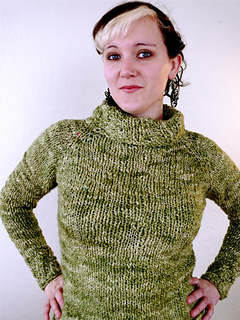 You will use a provisional cast on so the collar can be knit later. 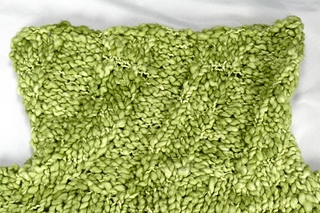 The hem is knit onto the body at a diagonal once the body is complete.